The dictionary defines twist as "a deviation in direction; curve; bend; turn". Shift is defined as "a change or transfer from one place, position, direction, person, etc., to another." Both of these terms can be applied to storytelling and they are often confused for one another. A twist is a sudden alteration in the story, often occurring during the finale of a story and typically changing the meaning of something which has come before. A shift has more to do with the tone or focus of a story changing so that the audience has different feelings or sees the film from a different viewpoint. Brooklyn delivers a change in its story which can be seen as a twist, but is actually a shift which damages a once promising film. Eilis (pronounced "Ellish") Lacey (Saoirse Ronan) is a young woman who lives in a small village in Ireland in the 1950s. She receives a sponsorship through the church to start a new life in Ireland. Despite the fact that she's very scared and hates the thought of leaving her mother and sister, Eilis makes the journey and moves into a boarding house in Brooklyn. She gets a job at a department store and begins taking book-keeping classes in night school. At a community dance, Eilis meets Tony (Emory Cohen) and the two begin to see each other, quickly growing very close. But, when Eilis goes home to visit Ireland, she suddenly feels torn between two worlds. The first half of Brooklyn is a surprisingly charming, engaging, and funny experience. At the outset, this looks like it's going to be yet another bleak and depressing film about Ireland, and the harrowing journey on the boat certainly doesn't bode well. 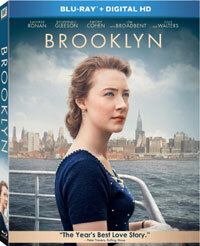 But one Eilis reaches Brooklyn, the movie takes on a very interesting personality. The other women in the boarding house (Emily Bett Rickards, Eve Macklin, Nora-Jane Noone, and Mary O'Driscoll), all of whom are overseen by Mrs. Keogh (Julie Walters) are all very sassy and love to insult one another. These scenes are unexpectedly humorous. Eilis supervisor at work (Mad Men's Jessica Pare), is strict but fair. Tony's courtship of Eilis is very sweet and we instantly take a liking to him. As with the scenes in the boarding house, the family dinner scene at Tony's is full of delightful moments. Eiils herself may be a bit bland, but we are rooting for her and enjoying her simple story. However, once Eilis returns to Ireland to visit, the movie takes on a different tone. I don't want to give too much away here, but Eilis' behavior changes and she becomes both very hot and very cold. It's quite clear that her time in America had made her a different person than the shy girl who once lived in this village, which is fine and makes perfect sense. But the metamorphosis of her demeanor also changes how the audience views her. Eilis finds herself faced with a moral dilemma, as is the viewer. Can we support the ways in which she is acting. For most viewers, I think that the answer will be no. This makes the film suddenly feel very cold and distant and the finale feels quite rushed and unfulfilling, despite its attempts to tie things back to the first act. These issues make Brooklyn feel like an incomplete film. Nick Hornby, is a very talented writer, has crafted the screenplay from a novel by Colm Toibin. But, Hornby really writes himself into a corner here. At its core, Brooklyn has a very, very simplistic story, and the third act feels like an unnecessary attempt to add more drama. This only makes the charming nature of the first act more evident. The charm can't change the fact that Brooklyn isn't much different from the myriad period pieces which show on Hallmark Channel. Yes, it's well-made and well-acted, but there's nothing here that makes the movie truly special. (Again, save for the fact that it bucks the trend of most films of this ilk by actually being funny and engaging -- I would imagine that Hornby has a lot to do with this.) I'm often baffled by the Oscars and I can't fathom how this was considered a Best Picture candidate. It starts off strong, but falls apart in the second half and most viewers will walk away feeling very dissatisfied. Brooklyn shows us an odd world without cash registers on Blu-ray Disc courtesy of 20th Century Fox Home Entertainment. The film has been letterboxed at 1.85:1 and the Disc contains an AVC 1080p HD transfer which runs at an average of 35 Mbps. The image is sharp and clear, showing no overt grain and no defects from the source materials. The colors look very good, as the film nicely balance bright and dark tones, and the image is never overly dark or bright. The level of detail is good and the depth works well, most noticeably in the landscape shots. The Disc carries a DTS-HD 5.1 Master Audio track which runs at 48 kHz and an average of 3.5 Mbps. The track provides clear dialogue and sound effects. The scenes on the boat do provide some notable surround and stereo effects, as Eilis deals with the rolling seas. Some of the street scenes provide these effects as well. The music sounds fine, but I didn't note any powerful subwoofer effects. The Brooklyn Blu-ray Disc contains an assortment of extras. We begin with an AUDIO COMMENTARY from Director John Crowley. The Disc offers eleven DELTED AND EXTENDED SCENES which run about 10 minutes and can be viewed with option commentary from Crowley. There are no new characters or subplots, but there is an interesting moment in the department store which addresses racism vs. capitalism. We get a series of brief "Promotional Featurettes" -- "The Story" (3 minutes), "Home" (3 minutes), "Love" (3 minutes), "Cast" (4 minutes), "The Making of Brooklyn" (4 minutes), "Book to Screen" (4 minutes) -- which offer numerous comments from the cast and creative team, as well as a nice amount of on-set footage. As implied by the titles, theses vignettes focus on various elements of the story, but mostly the story and characters, as Author Colm Toibin chimes in here. The extras are rounded out by the THEATRICAL TRAILER and a still gallery.